Karena Massengill. Photos courtesy of Massengill. 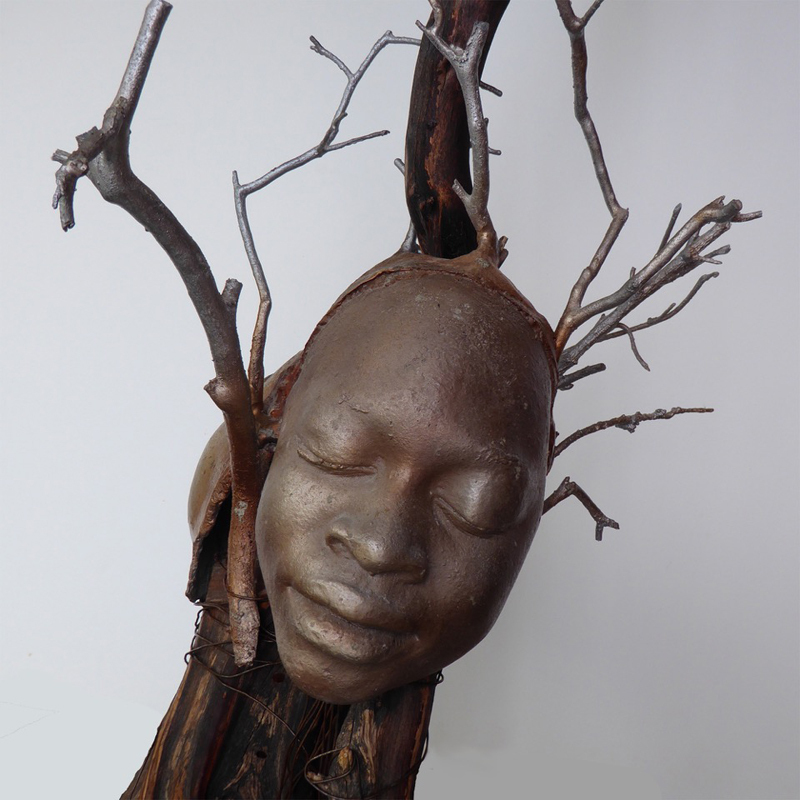 On October 10 from 6:00 to 9:00PM, Greenly Art Space will host the opening reception for a new exhibition, Discovery: From the Roots to the Leaves, which showcases work by Andres Alarcon, Nate Jones, and Karena Massengill. The show focuses primarily on sculpture. 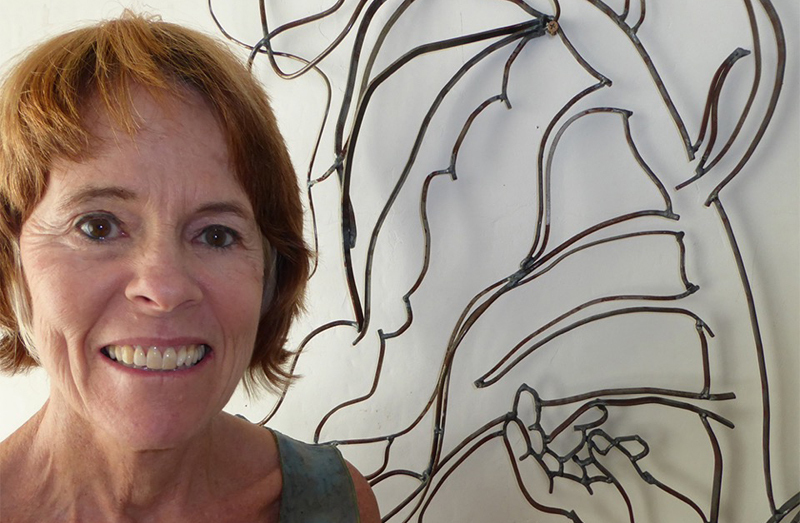 Massengill, who may be best known locally for her popular public art piece at Rosie’s Dog Beach, will be sharing work that spans decades, features a variety of media, and explores the theme of self-discovery. Long Beach Post: What does this work represent? Karena Massengill: The artworks represent ideas that I have worked with over many years. One of the ideas I realized, in a very powerful way when I was teaching at-risk youth, is that we do not have the power to change what has happened to us in our lives, but every day we have the choice of how we perceive these events. In the best case scenarios, we are empowered by them. Acting as a springboard; these memories can propel us forward to achieve a potential that, otherwise, might not be realized. Although this work, in my mind, is about the plight of others it is also reflective of my own struggles to overcome distant feelings of inadequacy. After all, I believe everything we do is a kind of self-portrait, though influenced by lenses of our choosing. What does your exhibition include? My work in the show includes two installations, nine paintings, and two sculptures. Though made over a period of 20 years, they are all related. As an object maker, I often use the images of my sculptures and incorporate them within my paintings and other media. The concept is the driving force. The different materials allow me to speak as if in different languages, reaching a larger population with my content. How did you develop this practice of working in a variety of media and formats? When I graduated from art school in 1975 at Tyler School of Fine Art, Temple University in Philadelphia, I immigrated to Toronto, Ontario, Canada. At that time I was introduced to the artwork of Nancy Graves, which provided tremendous solace for me! In those days, antiquated as it sounds, one was pressured to be a painter, sculptor, [to] decide on a path. She worked out her ideas in both simultaneously, and this has been a blueprint for me, giving me permission to explore many different techniques while working with a concept. How did you bring that to this show? In the works within the Greenly Show there is a predominant theme of self discovery, facing obstacles with courage, and achieving powerful results. The installation, Looking Out, Staying In was created after the 1992 riots. The idea, originally, was that people would bring their own experiences to the work, and have a glimpse into their own tendencies to interpret their world. Are these hands grasping for help, being aggressive, or angry? As viewed, the varied perspectives we bring provide an insight into ourselves. I believe the most powerful artworks inspire thoughts, feelings, and sometimes intangible experiences that do not need to be explained. I am most satisfied with my work when I can attain some measure of this. Dreaming Rebirth (detail) by Karena Massengill: cast and fabricated aluminum, with manzanita. In the painting, Survivors, there are images from sculptures, some from my public art project A Slice of Life at Lindbergh of children’s faces in bronze, and Poet Warrior, a sculpture of Ken Wibecan, an amazing African American writer friend of mine. He’s in bronze, with barbed wire around his head. There’s also a picture of the Dreaming Rebirth sculpture, which is also in the exhibition. This was created after the 1992 riots and incorporates a young African American boy and Asian girl, and is symbolic of the need for healing within these communities at that time. There is a quiet quality to this painting that I believe is symbolic of that process as well. Acid Voices, another piece, refers to the need to heal our environment, both within and outside of ourselves. How do you connect past themes to the present? If our youth grow up and feel disenfranchised and without hope, what kind of a world will we have? Unfortunately, this has been happening all too often as evidenced by the level of discontent many voice. In the best possible world, people discover their “Spark of the Infinite.” That’s my phrase describing that special intrinsic quality that every person contains; that they are responsible for discovering and developing. When this happens they have a sense of self-worth that no one can destroy, and are inspired to seek a path furthering their self-discovery and contribution to society. Educators are one of the ingredients that can help cultivate this process. Society, family, friends and associates are also a vital ingredient. I am passionate about wanting to make artwork that triggers something in the hearts and or minds of those who view it; to possibly enable a small fraction of this process. Though it may appear arrogant and presumptuous to even attempt this, my heart is in the right place, I know. Greenly is a rather non-traditional gallery setting. What about it has appeal for you? The first that I knew of it was the Birds show. When I went to see the exhibit, after the opening, I was entranced by the community aspect including the desire to help bring awareness and funding to help our delicate creatures. I was hooked! We bought a small artwork and, from then on, I was watching what Kimberly and David did with their magic! It is unorthodox with its location, and yet, every exhibition I have seen taps into what I feel is so important as an artist aspiring to use my voice in some constructive way, more than simply fulfilling my desire to create or explore my own egotistical needs. I love the way that Greenly always has some important theme they are working to express. It is fascinating to me that Kimberly also allows the space to be used by a therapist, counseling people for whom being surrounded by artwork may tap into a healing process. How does your gallery work influence your public art work, and vice versa? It is a challenge to maintain a relationship with my studio work when working on public art projects. I want to have a product for the public that reflects me the artist, but is also sensitive to the needs and desires of the public. It is my goal to create art that is accessible, and not too esoteric as to be a complete mystery or an affront to the general public who are paying for it and walking by it regularly. However, I also aspire to design and create artwork with an edge that triggers ideas and feelings from the viewers. It has been an honor to have the opportunity to be a part of this process, and I have been thrilled with the reception for my most recent public art installations Rosie Dog Beach, as complete strangers have contacted me regaling their positive reactions and enjoyment upon viewing it. Also there have been several to comment on how their dogs reacted seeing the works with curiosity and engagement! I am also awaiting the installation of another completed public art project I designed for the City of Downey’s Gateway project. I look forward to more public art projects that come my way! One thing I am pretty excited to be included in the recent acquisitions show at the Long Beach Museum of Art in November! I was reading their online newsletter, and there was my name. Two of my dear friends and amazing artists, Terry Braunstein and Barbara Strasen, are having large survey shows opening at the same time. I am in the process of exploring, always. It is a quandary, as I want to continue to develop familiar themes and concepts with different materials and techniques, but also feel adamant for the need to take risks. I love the excitement of the creative process. To learn more about Karena and her work, visit KarenaMassengill.com. Greenly Art Space is located at 2698 Junipero Avenue, Suite 113, in Signal Hill. Gallery hours are Monday, Wednesday and Friday from 11:00AM to 2:00PM. For viewings outside those hours, call 562.533.4020 to make an appointment. The exhibition runs through December 12. To learn more about the gallery and its programming, visit GreenlyArtSpace.org. Read an interview with Greenly Art Space founder, Kimberly Hocking.